Tulsa City Hall is located at 200 Civic Center, Tulsa OK 74103; phone: 918-596-2100. Photo: The Riverside Studio, also known as Tulsa Spotlight Club or Spotlight Theatre, was built in 1928 at 1381 Riverside Drive. 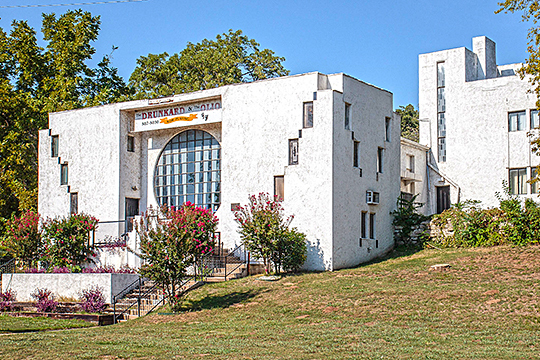 It was designed by architect Bruce Goff in the International Style. It was built as a house with a studio wing for a music teacher named Patti Adams Shriner. It was listed on the U.S. National Register of Historic Places in 2001. Photographed by user:W. R. Oswald, 2012, (own work) [cc-by-3.0 (creativecommons.org/licenses/by/3.0)], via Wikimedia Commons, accessed April, 2013. Like the rest of the nation, the oil business and Tulsa did not escape unscathed by the Great Depression of the 1930s. Further worsening the status of the oil industry in Oklahoma was the October 1930 discovery of oil in the East Texas field. Forty-five miles long and five to ten miles wide, the East Texas field quickly yielded a sufficient amount of oil by itself to satisfy national demand. The worsening economic conditions combined to such an extent that by 1933 the price of oil had reached bottom of the barrel prices and a good portion of Tulsa's residents were jobless. Although oil prices stabilized between 1934 and 1940, the decade of the 1930s proved to be difficult for Tulsans, as all Americans. In 1941, the city's population stood at only 142,157. This represented a growth of only 899 citizens since 1930. The WPA Guide to 1930s Oklahoma (Lawrence, Kansas: The University Press of Kansas, 1986),206-208. Ibid., 208. See also Angie Debo, Tulsa: From Creek Town to Oil Capital, (Norman, Oklahoma: University of Oklahoma Press, 1943),86-88. Ibid.,208-209. See also Debo, Tulsa, 88 and 97-99. Danney Goble, Ph.D., Tulsa! Biography of the American City (Tulsa, Oklahoma: Council Oak Books, 1998), 139-140, 143, 151 and 181. See also WPA Guide, 205. † Savage, Cynthia, City of Tulsa, Stonebraker Heights Historic District, nomination document, 2006, National Park Service, National Register of Historic Places, Washington, D.C.